Who was the first Australian to play soccer for England? The answer to this trivia question might stump most Australian soccer followers. I suspect the majority might go for Tony Dorigo of Leeds United who in 1993 was holding down the left back spot in the absence through injury of Stuart Pearce. Some might raise the name of Craig Johnston, who played twice for the England Under-21 team, though he did not receive a full international cap. One possible answer is Frank Mitchell. Frank who, you may ask? I came across Frank Mitchell for the first time when a colleague at Deakin University brought back from the United Kingdom a copy of the Daily Worker Football Annual for 1948-49. This handbook, produced by the newspaper of the Communist Party of Great Britain has an exclusive feature article by Leslie Compton of Arsenal, brother of the more famous Denis, who was also an Arsenal player as well as an England cricketer. It also has many pages of football pools information and advertisements for everything from Mars bars to trusses. Among the five players of the year selected by A A Thomas are Stan Mortensen of Blackpool and England, George Young of Rangers and Scotland, John Rowley, centre forward for Manchester United, Harry Johnston, captain of Blackpool and Frank Mitchell of Birmingham City and England. Well, nearly! I quote from the appreciation of Mitchell. “tall, golden-haired wing half-back of Birmingham City, must have wondered last season what he had done to offend the selectors. Certainly his consistent displays with the Division Two champions could not have irked them, and though his qualifications for England are somewhat slimmer than most from the point of view of birthplace, neither fact seems adequate reason for his constant omission from the England team. He is an Australian, born in Sydney, New South Wales, 25 years ago, and, naturally, is a cricketer good enough to be a Warwickshire professional. An all-rounder, he bowls a good medium-paced ball, and might develop rapidly if soccer were not his first love. He has once appeared in England’s white shirt—against Scotland in the unofficial Bolton Disaster international two seasons ago, in a game featured by the inability of either side to do itself justice. If he continues this season as he did last, there can surely be no further reason for refusing him a cap. Strong in the tackle, and a neat, quick distributor who puts a great deal of thought into his work, he is a player for everyone who likes to see football played in the classic manner”. So he did play for England albeit in an unofficial game in aid of the victims of the tragedy at Burnden Park, Bolton on 9 March 1946 when 33 people died in a crush during a game against Stoke City, for whom Stanley Matthews played on that ill-fated day. This was before Joe Marston went to Preston North End in 1950. Mitchell played 93 games with Birmingham City, 75 for Chelsea and 193 for Watford before ending his career in 1956. He never did get that full cap in an official game. As a cricketer he played 17 first class matches for Warwickshire between 1946 and 1948. 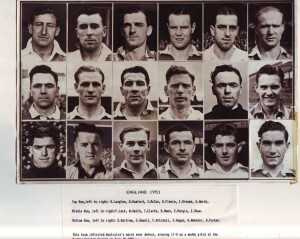 In 1951 England sent a professional football team to Australia on tour. Mitchell was one of the poster boys for the pre-tour publicity. The English squad was not the strongest professional side which could have been sent, and the five test matches are only counted as B internationals in the records of the Football Association. 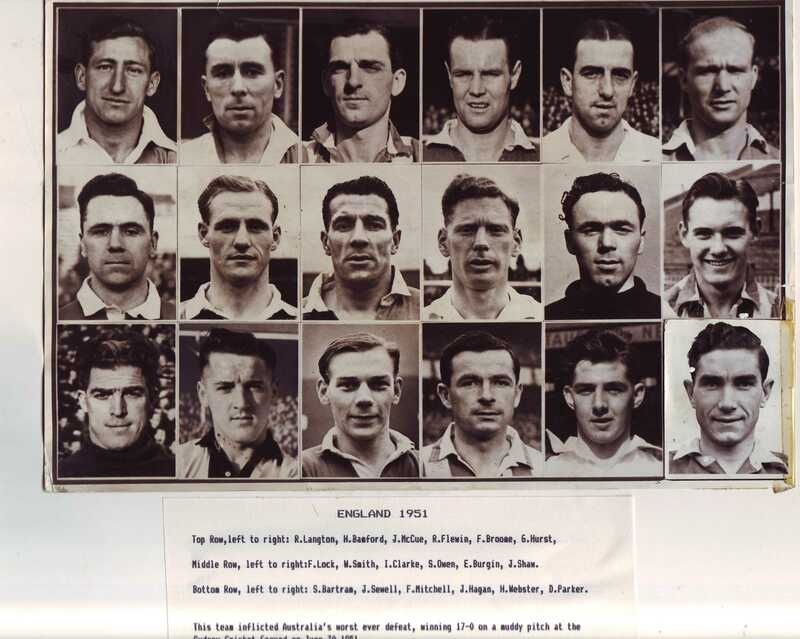 There were some high quality players in the party from goalkeeper Sam Bartram of Charlton Athletic, Reg Flewin of Portsmouth who captained the side and Syd Owen of Luton in defence and Jackie Sewell, then at Sheffield Wednesday, and Jimmy Hagan of Sheffield United in attack. 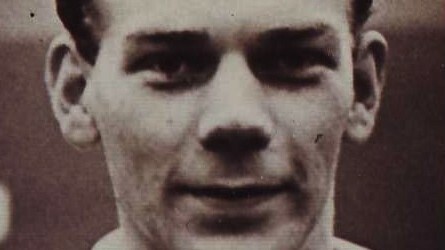 Frank Mitchell, then playing at Birmingham City, was selected to make the tour and his picture appeared in the publicity photograph which accompanied the team, but for some reason he did not travel. Mitchell played cricket for Cornwall in the Minor Counties in the northern summer of 1951 and may have thought it was more lucrative to do so. In all the English football tourists played 21 games and scored 157 goals and conceded only 14. Sewell was top scorer with 35, Hagan had 28 and Ike Clarke of Portsmouth got 23. In all over 190,000 fans watched the games, with the largest single attendance being the 46,014 who crowded into the Sydney Cricket Ground for the first test. The game against Victoria drew 29,652 to the MCG, while that against an Australian eleven two days later attracted 25,041 at Punt Road Oval. Steve Czauderna of Polonia, the Victorian keeper, may have conceded seven goals to the Englishmen, but he saved so many more that his team-mates insisted his photograph should appear on the cover of the next issue of Soccer News. All the goals in that game were scored by Jackie Sewell. Alex Barr, who could be highly critical of the local game, said the Czauderna’s performance ‘put him in international class (UK standard)’. In July three more test matches were played in Brisbane, Sydney and Newcastle and Australia made much more of a game of it in each case. Though England won all three the results were closer, 1-4, 1-6 and 0-5. Ron Lord was in goals in all three games and Bob Lawrie from Ipswich captained the side and kept it together. Lawrie was another who had a spell in England with Portsmouth. Harry Robertson and Eric Hulme with a penalty scored the Australian goals in these matches. Lord went on to alternate with Bill Henderson in goals for Australia through much of the 1950s. Meanwhile Mitchell continued to play cricket with Cornwall and subsequently he opened the batting and bowled for Warwickshire seconds until at least 1963. He played club cricket with Knowle and Dorridge, where he became groundsman and club secretary and stood as umpire in their match with Old Edwardians in 1980. Mitchell was born on 3rd June 1922 in Goulburn in New South Wales and died at Lapworth in Warwickshire in 1984. I have no record of any appearances in Australia before or after his time in England and would appreciate any other information on this unknown Australian star.